Diner Dash has been around for 6 years, and has graced several platforms. Now its success is being ported over to Xbox 360, Wii and PSN as a downloadable game. Will it keep its Michelin Star or will it be star of Gordon Ramsay’s Kitchen Nightmares? Can you keep all these screaming customers happy? 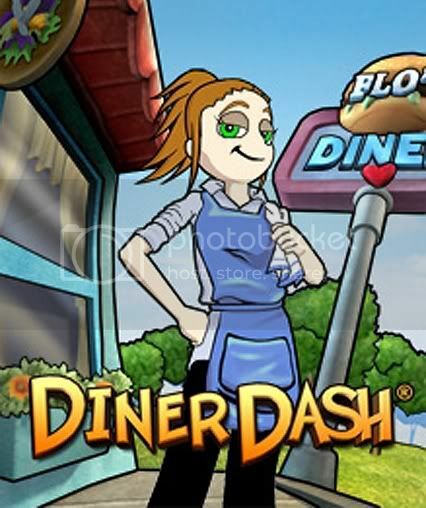 Diner Dash is an action strategy title, with the player taking control of Flo, who has quit her job to run her own diner. Gameplay has you seating customers in the diner, and guiding Flo around the restaurant to serve them. You start off with a dilapidated diner that you might find in Ramsay’s famous show, and as you earn money from your customers you can spruce up the diner and entice more customers in, and eventually you build further restaurants. You have a time limit for each day, and you have to reach a certain monetary target within this time limit. Once you have the diners seated, you have to wait until they are ready to place their order, which they do by putting their hands in the air like kids in a classroom. You then take the order to the chef, who sets about cooking the meals. The meal then appears on the counter to serve to the hungry customers. After they have finished, you take the empty plates to get cleaned, and are left with a tip, depending on how quickly they were catered for. Each diner has 10 hearts above their heads, which gradually depletes if they are left for too long. When there are no hearts left the diners will leave the restaurant, taking a stiff penalty from your score in the process. Thankfully as you go through the game you are given things like coffee machines, to dish out lattes to grumpy customers, which adds more hearts above their heads. Unfortunately any upgrades you get happen automatically, so there is no way to spend the money on upgrades to whatever you want in your diner, which is a shame. Try matching all those customers to their rightful coloured chairs! A strange aspect to the game, which is in contrast to the ‘reality’ of the game, is the fact that customers are colour coded; and to get additional tips, you need to match the colour of the diner to the colour of the seats. This has you rotating customers, like a game of culinary Tetris, until you match them up to the right coloured seats. Unfortunately, the camera angle that the game uses isn’t very good and you have difficulty seeing exactly what colour of seat is where, making it difficult to see exactly what you are doing. 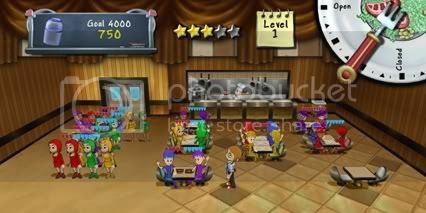 It can get quite frantic as you go through the game balancing serving and seating customers. If you do chain several tasks together you get a higher score, so you have to see if it’s worth keeping folk waiting, while you try desperately to keep the orders flowing. The game also has a multiplayer mode, which is playable online (although we tried on three consecutive nights to find a game and found none). Playing locally can be a lot of fun though, with you splitting tasks with your partner to keep service flowing. All in all it’s more of a snack than a full gourmet meal, and is a little bland; but you can have a lot of enjoyment here, especially with multiplayer, for a few hours at least. But after a hard day’s work, do you really want to start serving restless customers repeatedly?